As much as our brains prefer to think about performance as a static quantity like a Madden rating, human beings – and football – are far more complex than that. Ups and downs are a normal part of life and not always indicative of a trend one way or the other. The 10 players below didn’t have the 2018 season they would have hoped, but we’ve seen enough to believe that they’ll turn things around big in 2019. A year after Ramsey firmly put himself in the conversation for best cornerback in the NFL, Ramsey inexplicably took a sizable step backward in year three. He had fewer picks (3), pass breakups (9), allowed more yards (749), allowed a higher completion percentage (54.6) and allowed a higher passer rating (73.8). 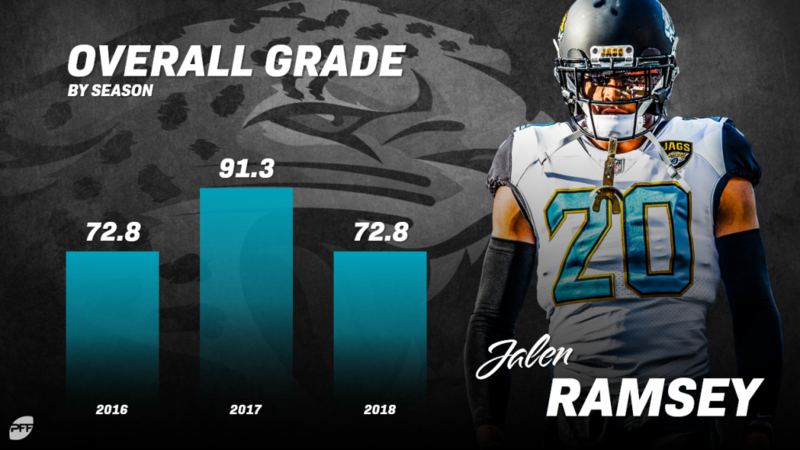 Those are still pretty darn good numbers though, and I’m not expecting it to be too long before Ramsey is back to his 91.3 overall grade level from 2017 once again. Rhodes has never quite graded out at a level that matched his public perception. Much of that was due to a fairly severe penalty problem that saw him average over 10 a season for the past four years. In 2018 those penalties persisted (he had nine), but his efficiency when targeted wasn’t close to years past. He allowed the highest completion percentage of his career (65.2%), the second-highest passer rating (88.4), and totaled the fewest combined picks and pass breakups (6). He’ll only be 29 in 2019 though and there’s little reason to believe it was any more than a blip on a solid career. Smith had been a pinnacle of development in his first four seasons in Jacksonville. The linebacker’s grade improved each of his four seasons in the NFL until he earned an 81.9 overall grade in 2017. Like many on the Jaguars defense in 2018 though, Smith took a massive step back, earning his lowest overall grade since his rookie season. After earning 60-plus stops each of the last three seasons, Smith only mustered 50 in 2018 while still struggling with 21 missed tackles. That sort of playmaking ability didn’t just disappear though, and we expect him to get back on his progression. This one is fairly self-explanatory after Griffen took a six-week leave in the middle of the season. Unsurprisingly, it led to the lowest pass-rushing grade of Griffen’s career (61.4). He is 31, and one would expect him to be slowing down a bit, but bull rushers like Griffen tend to age gracefully. Another player who was part of a defense where seemingly everyone had a down year. Collins’ 70.4 overall grade and 34 defensive stops were his lowest since his rookie season. He’ll be a free agent this offseason and can hand pick a role that suits him best. 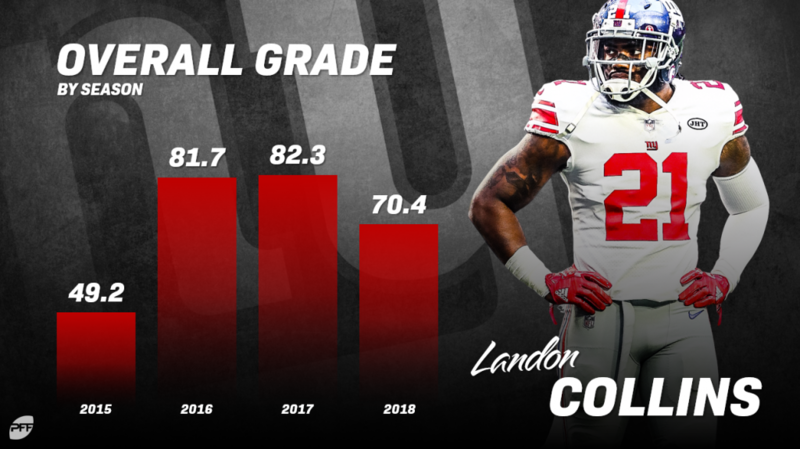 We’ve seen a high end from him that few are capable of in this league as he was a top-10 player in the PFF 101 back in 2016. Without his fellow linemate Joey Bosa, Ingram’s efficiency took a drastic step back in 2018. Some of that can also be explained by the fact that the Chargers couldn’t afford to have Ingram come off the field, and he rushed the passer 547 times, the most of any season in his career. With Bosa back and likely a lightened load in 2019, Ingram should get back to his 80-plus pass-rushing grade. What was once one of the best offensive lines in the NFL as recently as 2016, the Raiders were among the worst in 2018. Some of that was obviously due to rookies at both left and right tackle, but Osemele’s head-scratching decline also played a part. His 97.6 pass-blocking efficiency was his lowest figure since 2013. Not even 30 years old, Osemele should be in the prime of his career which makes his downturn that much more unexplainable. Yet another player who has a pretty obvious explanation for his downturn. Even though he only missed three games with injuries in 2018, he was quite obviously hampered all season long. He had hip, knee, and groin injuries reported throughout the season that limited him to 618 yards and only 50 catches on the year. Only 30 years old and one of the best route runners in the league, Baldwin will still produce when he gets healthy. There was a distinct difference in Newton’s play pre and post shoulder injury this past season. Before the Steelers game, Newton had earned an 81.4 overall grade. After that game where he was injured, Newton notched only a 56.3 overall grade. There’s no guarantee with shoulder injuries, but back healthy with a young set of offensive weapons, Newton should be at his best in 2019. 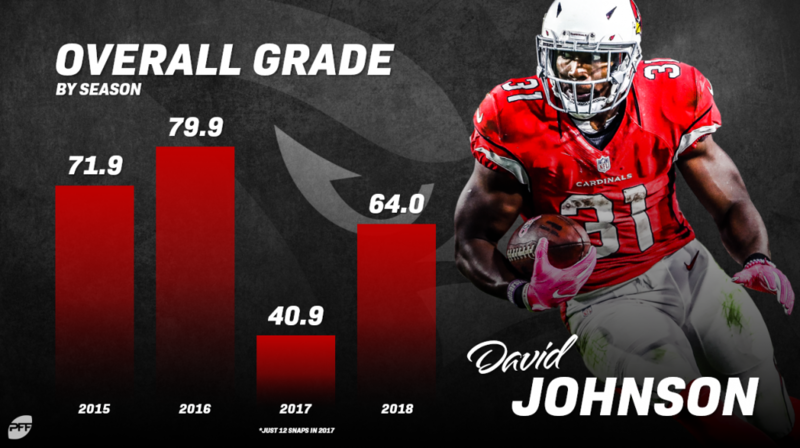 Johnson simply had no chance in the offense constructed in Arizona last year. They had the lowest-graded offensive line in the NFL a season ago, and his usage in the passing game was wholly uncreative. Johnson lined up outside of the backfield on only 6.8% of his offensive snaps in 2018. That’s a crime with how talented Johnson is as a receiver. In Johnson’s last healthy season in 2016 under Bruce Arians, that number was 20.4%. Kliff Kingsbury won’t let his most talented offensive weapon go to waste in 2019.